Blog labels are tools. In my blogging arsenal, they aren't optional. They're necessary and even vital. But why? Labels are used for organizing. Labels help make your blog posts available for reading, long after they were first published, giving them more mileage instead of gathering dust in your archives. 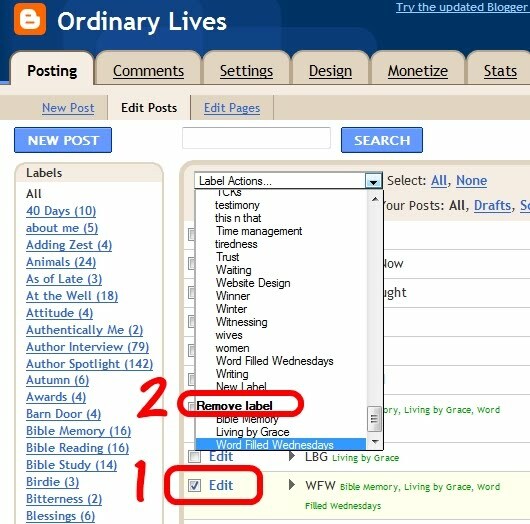 Blog labels are not just key words mentioned in your post. You don't want 100 different labels. I've heard no more than 25 labels, which makes sense, even if it can be hard impossible to do. Limit yourself to some well chosen labels. 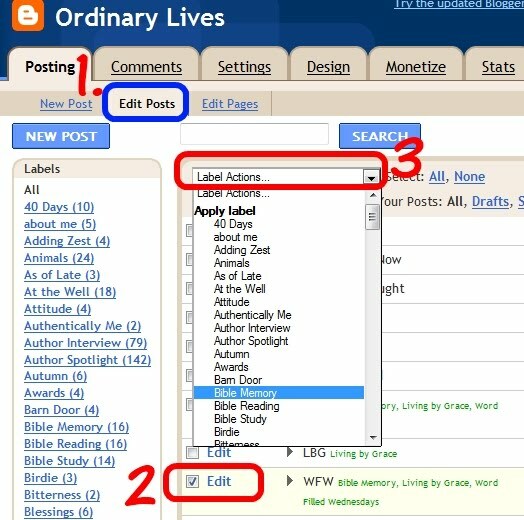 Choose your labels based on the things you blog about. Think TOPICS when you label your posts. A side benefit will be that it helps you find a focus to your blog, if you don't know it already. Labels, done correctly, will enable your readers to click on a label they see and find more posts on that topic, which blows the dust off your archives and gets more mileage from your blog articles. Check the box next to the post that you'd like to add a label to. Under the Search box, click the drop down menu for Label Actions. 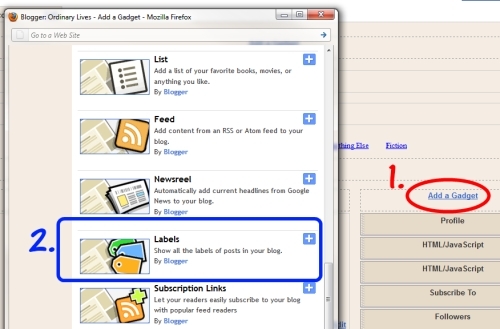 That will give you a list of all the labels you currently have published on your blog. Click the label you'd like applied to that post. You can only add one label at a time, but if there are multiple posts you'd like to add that label to, simply check the box for each post you want it added to. Check the box next to the post that you'd like to remove a label from. Under the Search box, click the drop down menu for Label Actions. At the very bottom of the labels it offers, you'll find "Remove label" followed by a list of labels applied to that post. Click the label you'd like removed from that post. Once again, you can only remove one label at a time, but you can remove it from multiple posts at the same time by checking the posts that you want it removed from. 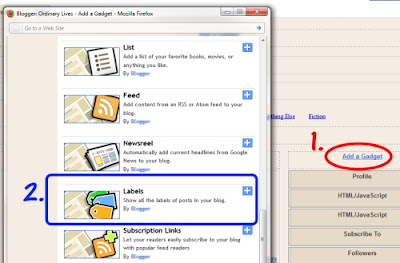 Many bloggers have a list of their labels in the sidebar, others of us use our labels in our navbars/linkbars (tabs, above or below the blog header), a great way to display your blog features and main topics. Later I'll tell you how to use your labels in your navbar/linkbar. There on your Page Elements, in the sidebar area, click Add a Gadget. In the pop up menu list, select Labels. Select how you'd like your labels to appear, and click Save. It will automatically add it to the top of your sidebar area, but you can position it anywhere you'd like by clicking and dragging it. Okay - now I have to review my labels! I have 39, which I guess isn't bad. Hmmmm. Great post, sweets!